According to Bankrate.com, bank fees rose again last year. Meanwhile the percentage of accounts eligible for free checking, which had risen to 76% in 2009, fell again last year, now to only 39% of accounts and eligibility requirements for free checking became more onerous (such as larger minimum balances). Other fees rose as well. And according to the FDIC’s study of unbanked and underbanked consumers, between 2009-2011 the number of unbanked consumers rose by about 1 million and the number of underbanked consumers rose by about 3 million (the numbers rose in percentage terms too, 0.6 percentage point increase for unbanked and roughly a 2 percentage point increase in underbanked rates). 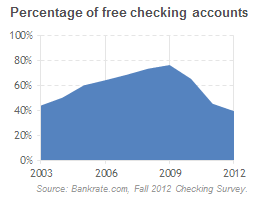 For an apples-to-apples comparison of the years, in 2011, 45% of bank accounts were eligible for free checking, so the big decline in free checking was during this same period. Some of the higher fees and higher unbanked numbers surely is due to the recession. But some of the rise in the number of unbanked and underbanked consumers is directly the result of the rising bank fees, which has pushed marginal consumers out of the banking system and deterred bringing in new consumers. And the rising bank fees are primarily the result of Dodd-Frank, the Durbin Amendment’s price controls on debit card interchange fees, and new rules on overdraft fees. Of course, both of these phenomena were entirely predictable (and predicted). Supporters of these regulations might nevertheless support them notwithstanding their unintended effects, such as higher bank fees and a resulting increase in the number of unbanked consumers (indeed, I’ve actually heard some people support them because of their predictable economic effects, such as forcing consumers to pay more for bank accounts or eliminating overdraft protection). I disagree, of course, precisely because reallocating these fees via politics doesn’t have just a distributional effect but also has this effect of driving people out of the mainstream financial system. But whatever one thinks about the unintended effects of consumer banking regulation and price controls over the past few years, good policy analysis should not simply ignore them.